CHICAGO – In the latest HollywoodChicago.com Hookup: Film with our unique social giveaway technology, we have 30 family movie 4-packs (a total of 120 tickets!) up for grabs to the advance screening of the highly anticipated new film “Epic”! “Epic,” which opens on May 24, 2013 and is rated “PG,” stars Josh Hutcherson, Amanda Seyfried, Colin Farrell, Christoph Waltz, Beyoncé Knowles, Aziz Ansari, Chris O’Dowd, Pitbull, Jason Sudeikis, Steven Tyler, Judah Friedlander and Blake Anderson from director Chris Wedge and writers Tom J. Astle and Matt Ember. The film comes from the creators of “Ice Age” and “Rio”. When you enter to win below, you MUST answer whether you’d prefer TWO or FOUR tickets! To win your free “Epic” passes courtesy of HollywoodChicago.com, just get interactive with our unique Hookup technology below. That’s it! This screening is on Saturday, May 18, 2013 at 11 a.m. in downtown Chicago. The more social actions you complete, the more points you score and the higher yours odds of winning! “Epic” is a 3D CG adventure/comedy that reveals a fantastical world unlike any other. 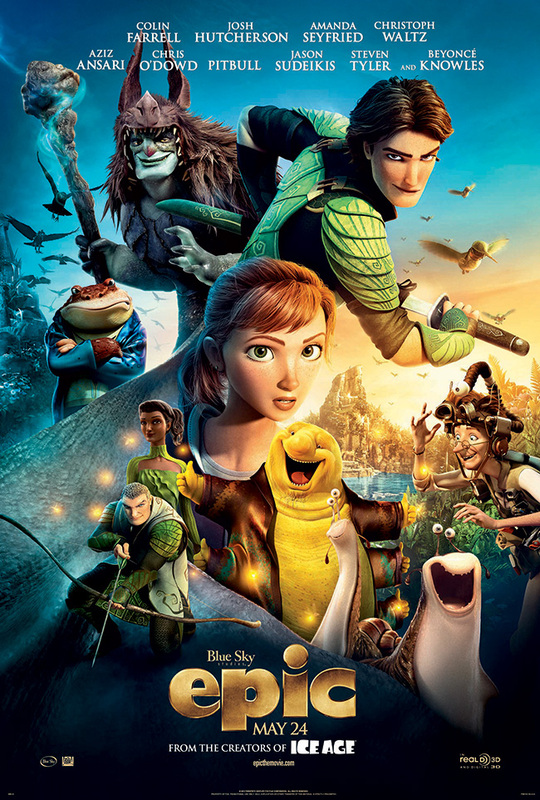 From the creators of “Ice Age” and “Rio,” “Epic” tells the story of an ongoing battle between the forces of good (who keep the natural world alive) and the forces of evil (who wish to destroy it). When a teenage girl finds herself magically transported into this secret universe, she teams up with an elite band of warriors and a crew of comical, larger-than-life figures to save their world… and ours. The movie poster for “Epic” from the creators of “Ice Age” and “Rio”. The movie trailer for “Epic” can be watched now below. This HollywoodChicago.com Hookup is simple! Just get interactive in our unique Hookup technology above. We will award 30 family 4-packs of movie tickets based on social entry numbers and/or randomly via e-mail for our “Epic” Hookup. Good luck! Winners need to arrive early as seats are consumed on a first-come, first-served basis. Since showings are overbooked to ensure a full house, winners are not guaranteed entrance and must arrive early. We recommend arriving at least 45 minutes before the showing’s scheduled start time. HollywoodChicago.com LLC is a promotional partner with the studio and its partners and doesn’t assume any liability for this giveaway. HollywoodChicago.com is not responsible for errors or omissions entered in user submissions. Note: Comments are closed in this Hookup.